TALENTED young footballer Perri King picked up her second Under 17 best and fairest award for the 2017 season when the New Norfolk Junior Football Club held its annual trophy night last month. This followed her earlier win in the STJFL Best and Fairest Awards. King, who had only recently 14, won the local club's newly-created Cathy Adams Medal by 25 votes from runner up Madison Shaw on 31. King collected six best-on-grounds in what was a successful season for the very keen footballer. In a close count in the boys Under 14 Best and Fairest, Zac Wheeler polled 43 votes to win by just four votes over runner-up Tyler Scanlon on 39. Both boys performed very well through the season and are fitting winners. In the boys Under 12s, it was a reversed result from the Under 14s with Brodie Scanlon (younger brother of Tyler Scanlon) winning with 55 votes, 22 votes clear of runner up Bailey Wheeler (younger brother of Zac Wheeler) on 33. A real family affair! Bailey Wheeler had recently played in the Tasmanian Under 12 team in Darwin and looks to have a bright future ahead. At the conclusion of the trophy presentations, life membership of the NNJFC was bestowed on Dean King who has been a tireless volunteer for the club. He has coached the boys from Under 9s in 2005 through to the Under 16s in 2012 and this season created history as coach of the first NNJFC Under 17s girls team, and what a season it has been. Also on his resume, as well as playing 290 games with the NNDFC, King has also coached the Under 18s and Reserves and is also an Eagles life member. Congratulations Dean, your knowledge and experience of football is very highly regarded and you are a very worthy recipient of this award. Well done to the NNJFC for naming the girls Under 17 Best and Fairest Medal in honour of Cathy Adams who has been an exceptional volunteer for club for many years and thoroughly deserves this recognition. It was great to have Cathy in attendance to present the medal. Thanks also to Vanessa Britten for her excellent work with putting the slideshows together for all three best and fairest counts - a top job as always. Well done to the NNJFC committee, coaches, team managers and officials. Your untiring efforts do not go unnoticed and if it wasn't for people like yourselves, junior football would not be where it is today. 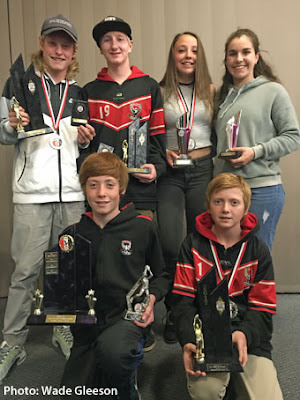 PICTURE - back from left: Under 16s best and fairest winner Zac Wheeler and runner-up Tyler Scanlon with Under 17s best and fairest winner Perri King and runner-up Madison Shaw. Front from left: Under 12s best and fairest award runner-up Bailey Wheeler and winner Brodie Scanlon.